Facts about Dwarf Umbrella Palm plant. "Scientific name for Dwarf Umbrella Palm is Cyperus alternifolius". The Dwarf Umbrella Palm gets its name from its fully grown height. It is an excellent container plant with a height less than 3 feet (91 cm). Dwarf Umbrella Palm grows to a grass like foliage and sometimes outgrows the container. It needs average watering and sometimes becomes difficult to maintain if the owner doesn’t get time to water it regularly. The Dwarf Umbrella Palm needs shifting to new pots at times if the soil dries too quickly. Lack of water in the soil weakens the plant within 3-4 days with discoloured foliage. Few tips necessary for its survival are shared below. Dwarf Umbrella Palm is always planted in pots with drainage holes. The Dwarf Umbrella Palm are watered till water comes out of these drainage holes. This holes help in flowing out of excess water and the soil stays moist according to its water holding capacity. The root of the umbrella palm plant may get rotten if the extra water is not drained out. Likewise, as told earlier, lack of water may kill the plant as well. If the Dwarf Umbrella Palm doesn’t survive in its current pot and shows discoloration then it’s time change the pot. There may be several reasons to it. The amount of soil in the pot may not be enough for the root of the plant, the soil may have lost its mineral content and water holding capacity or even though the soil is healthy for the plant it’s not trapping enough air and water for the plant to survive. So, if you decide to re-pot the Dwarf Umbrella Palm plant choose a pot that is larger than the current one. Prepare a potting mix that is specifically packed for palm plants and fill it to the pot up to one third of its height. The potting mix must have ample amount of organic matter which helps in retaining moisture. Usually sphagnum peat moss mixed with vermiculite works as the best potting mix for Dwarf Umbrella Palm. 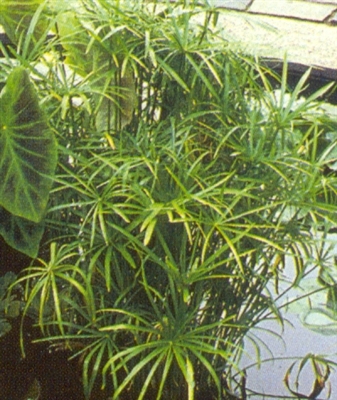 Put the Dwarf Umbrella Palm plant in the middle and fill rest of the potting soil around it. Knock the bottom of the container to fill the gaps in the soil so that the plant holds still. Water the new pot with the Dwarf Umbrella Palm plant with a slow flow of water till it comes out of the drainage holes. Dig a stick and tie the plant with it for support. After a couple of days, if the foliage doesn’t fade, you should know the re-potting has succeeded and you may remove the supporting stick.